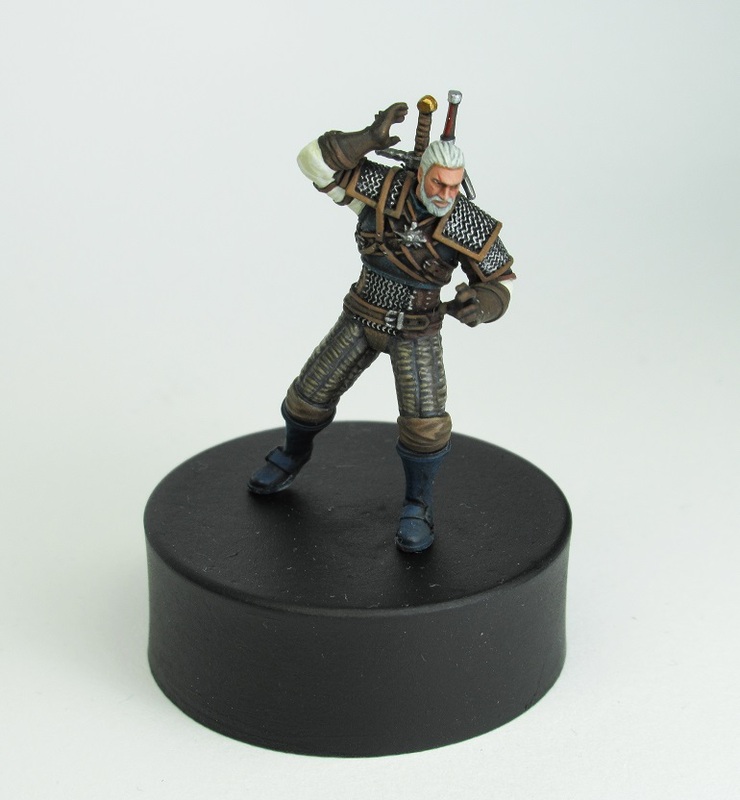 Couple of months ago I ordered online a Witcher miniature from Artel W. Miniatures (clicky!) which came at the two weeks ago. 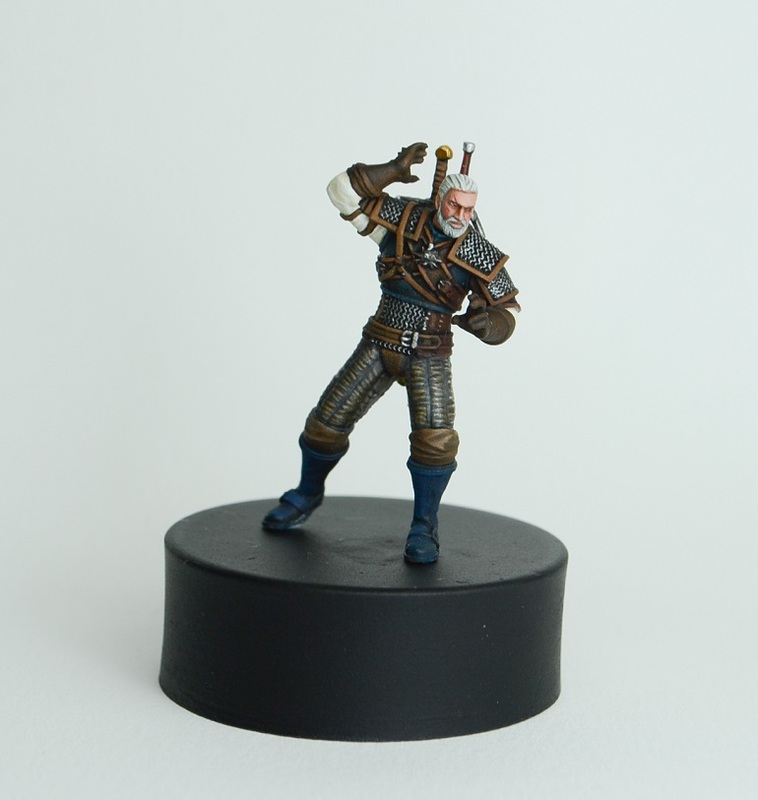 The miniature itself was well done – the resin casting was the best I ever seen (including forge world miniatures I got in the past). It had almost no mould lines and good cuts, allowing quick assembly without putting a lot of green stuff in the recesses. The model is made in 28mm scale – although there is a huge difference between this “realistic ratio” compared to Games Workshop “Heroic” approach. 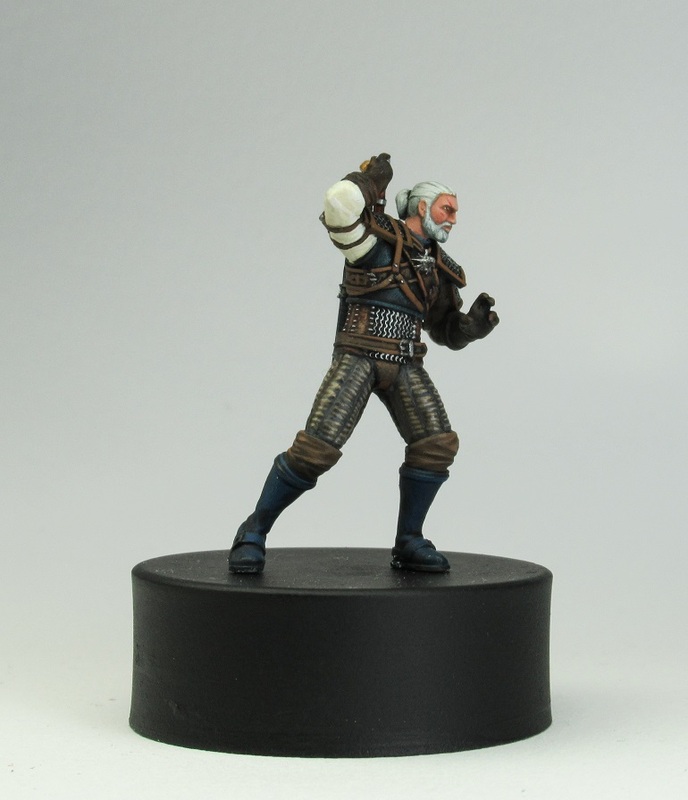 In general, this Witcher seems much smaller and the features are tiny. Honestly, this was the littlest miniature I ever worked on. Due to this, it was quite challenging to replicate same amount of smooth transitions and details. As I am still working on the Darkoath Chieftain I wanted to spend not too much time on this model – just to have a quick paint job and continue working on the previous miniature. Hence, I decided to have much different approach than usual – much less focus on transitions and smoothness, much more on efficiency as well as simplicity. As of this, the model was painted in less than 8 hours including assembly. The quality is much lower too (aside of the face), but the overall effect I believe is still good and could be used on tabletop or in board games. Firstly, I started with black primer (by GW, as in my experience it is the best for resin miniatures), which then was given a basecoat of Dubai Brown from Scale75. The brown undercoat goal was to harmonize the colour pallet on the miniature, as it will influence all of the colours you paint on top of it. As I wanted to paint this in as small amount of time as possible, I used a LOT of washes along the way. Other thing, I decided to use TMM, as these small details would take much to much time to pain with NMM. The only element which was painted with a higher standard – was the face. EVERYTHING got a wash of Nuln Oil. I diluted it a bit with Lahmian Medium, as it seems to go into recesses a bit more smoothly and pool’s less. The next step was to work on the details. Chest piece, boots – As the surface is small I went with doting – using the tip of my brush I painted small dots of Caspian Blue with Grey, adding more and more grey to the mix. After applying the dots, I gave it another wash of Nuln Oil. As for the boots – I worked on them using Wet blending. Caspian Blue and Black mix is pretty easy for this method (in general blending with dark blue is fairly easy). Leather parts of chest piece and armour – I had the same approach as with the chest piece, used dots for the the better part of the belt on the chest piece. The dots were made by adding Yellowed Bone to the base mix and a bit of yellow paint. I repainted this surface couple of time, but still the effect is not what I was looking for. As I wanted to finish the model as soon as possible – I left it as it is. The gloves and the knee guards, were painted with standard layering, by adding Yellowed Bone to the mix. Moreover I gave them another wash of Nuln Oil. Pants – the base mix got another wash of Nuln Oil. Afterwards I picked up details with pure base paint. As the effect wasn’t still in line with the screenshort I had from the game deiced to glaze it over couple of times with a mix of Dark Angels Green and Dubai Brown. Metal elements – simply dry-brushed with Chainmail (an Old paint by GW). For the swords I simply washed them with Nuln Oil and highlighted it with a mix of Chainmail and Metal Medium by Valleyo. It is worth to mention that Metal Medium is one of the most crucial paints when painting TMM – you can treat is as white paint for metals. It has a strong metallic look and can be mixed with almost all paints to create their metallic versions. Shade: Base plus Dubai Brown – to an almost pure Dubai Brown. At that point, I added some Black. For the scars, I simply added Antares Red to the base mix and painted small lines.